Even as the weather cleared up with bright sunshine throughout the day today, snow and rain during the last two days led to a decline in temperature. The weather finally cleared up after two days of rain and snow in the higher reaches. Icy cold winds swept most parts of the state, with high mountains clad with snow. The Himachal Pradesh High Court (HC) today stayed the de-allocation of the Gourangdih ABC coal block in West Bengal, allocated to a joint venture company of the Himachal EMTA Power Corporation Limited and the JSW Steel Limited, by the Union Ministry of Coal. All departments of the state government are gearing up to face the scrutiny of the high-powered committee in the Prime Minister’s Office (PMO) on a review of the Result Framed Document (RFD) during its two-day visit to the state from December 3. 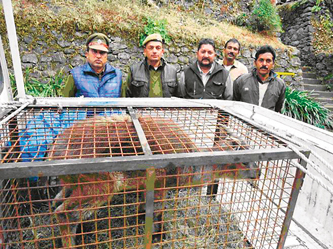 The Gopalpur zoo in Kangra district has new guest, a Himalayan tahr rescued by forest officials in Chamba. The Himalayan tahr (hemitragus jemlahicus) or the common tahr is a large ungulate of the wild goat family. The Himalayan tahr is a rare species sighted in the wild and moves in herds in the higher reaches of the Himalayas. Its habitat is the rugged hills and mountain slopes of the Himalayas. It spends the summer grazing in the higher reaches and comes down in winter. Will the initiative of the Himachal Pradesh Government of declaring fourth Saturday of every month a holiday for its pampered employees finally usher in the much desired work culture of delivery and efficiency? Tax evasion by Cadbury India’s Baddi-based unit echoed in the Parliament yesterday with Minister of State for Finance SS Palanimanickam submitting a written reply in the Rajya Sabha stating that the Directorate General of Central Excise Intelligence (DGCEI) had detected tax evasion in its operations. Students of HP Central University today held demonstration on the university campus at Chatri after yesterday’s road accident at Ladwara in which 36 students were injured and had a narrow escape and protested in support of their demands. The anti-ragging committee of Dr RP Government Medical College today expressed concern over the directions issued by the Director Medical Education (DME) to revoke the suspension orders of two interns of the college. The orders were issued by the principal of the college on the recommendations of hostel wardens, disciplinary committee and the college council. The Palampur Welfare and Environment Protection Forum has expressed concern over the delay in construction of new projects for which the foundation stones were laid by the Chief Minister and other ministers two years ago. The forum at a meeting held here today urged the state government to take up the construction of such projects at the earliest. The police registered a case of murder and destruction of evidence today in connection with the recovery of the half-burnt body of an unidentified person from Sunpur jungle under the Jogindernagar police station. A speeding Tata Sumo collided with a truck coming from the opposite direction on the Pathankot-Mandi national highway at Kandwal, near here, late last night. Around 30 bus passengers were injured when two HRTC buses collided this morning near Dangadi village under the Nadaun police station. The injured, including schoolchildren, were taken to Regional Hospital here. Deputy Commissioner, Kangra, KR Bharti today visited the DRPGMC, Tanda, and enquired about the health condition of the students of HP Central University who were injured in a road accident at Ladhwara yesterday. Former minister Singhi Ram today refuted the allegations of sitting legislator and Congress candidate Nand Lal of having worked against the Congress in Rampur constituency. Himachal Lokhit Party (HLP) convener Maheshwar Singh today said the HLP had not decided whether or not to render support to the Bharatiya Janata Party (BJP) in case of a fractured mandate. He said the issue would be decided after the declaration of results. According to the forecast of the Meteorological Centre, the weather is expected to remain clear with no chances of more rain and snow in the next few days. The western disturbance which caused the bad weather had started moving east. The minimum temperature in Shimla was 2.7 degree Celsius, Sundernagar 4.8 degree Celsius, Bhuntar 4.8 degree Celsius, Kalpa -3.5 degree Celsius, Dharamsala 7.6 degree Celsius, Una 8.6 degree Celsius, Mandi 4.1 degree Celsius, Nahan 7.1 degree Celsius, Keylong -3.9 degree Celsius, Palampur 5.0 degree Celsius, Solan 2.4 degree Celsius and Manali -1.0 degree Celsius. Manali: After a fresh spell of snowfall in the upper Manali area, the bright sun and clear sky greeted tourists and local residents on Friday morning. The entire upper Manali region received a fresh spell of snow on Thursday night. 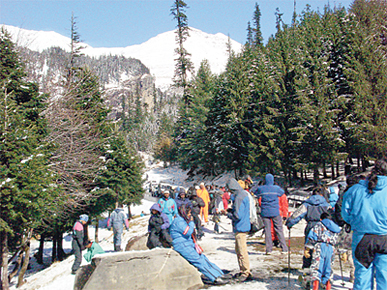 The Solang valley also had a fresh spell of snowfall, leading to tourists coming in large numbers. After a bright and sunny day, hundreds of tourists in Manali rushed to Kothi and the Solang valley to enjoy fresh snowfall and snow-related activities. With the season’s first snowfall in the upper Manali region, a number of temporary kiosks came up in the upper Manali area, offering for sale woollen garments and snow shoes for unprepared visitors. Due to the fresh spell of snowfall, vehicles could not be taken beyond Kothi, 13 km from here, on the Manali-Rohtang road. Trees and hills covered with snow presented a picturesque view to tourists. Staying the de-allocation, a Division Bench comprising Justices RB Misra and Surinder Singh directed the Secretary, Union Ministry of Coal, to file his response within four weeks and listed the matter for January 9. The court passed the interim order on a petition filed by Himachal EMTA, challenging the letter in which the coal block was de-allocated and the deduction of 50 per cent of the bank guarantee, amounting to Rs 6.67 crore, was sought. As per the letter of the ministry, the de-allocation of the coal block allocated jointly to Himachal EMTA and JSW Steel came after the Inter-Ministerial Group (IMG) found that progress on the Gourangdih ABC coal block was unsatisfactory. It was stated in the petition that the Union Coal Ministry allotted the coal block jointly to the petitioner and JSW Steel for mining and developing captive coal for meeting the proportionate share of coal requirement in the respective power plants of the petitioner and JSW Steel. It was further stated that the petitioner was a joint venture and was selected through a competitive bidding process. It was added that the joint venture was formed to achieve the objective of setting up a 2x250-MW pit-head coal-based thermal power plant to provide thermal power primarily to Himachal Pradesh. It was further pointed out that the thermal power project was an important project for Himachal Pradesh which was envisaged to augment the existing power capability of the state through hydro power to meet the growing needs of the state and to tide over the acute shortage of hydro power in winter. The petitioner was allotted the Gourangidih ABC coal block in the Raniganj coal fields on a 50:50 sharing basis with JSW Steel. It was further submitted that the Centre had de-allocated the coal block on the grounds of unsatisfactory progress in implementation and development of mining. The petitioner company challenged this letter on the grounds that a proper opportunity was not given to it to present its case before the competent authorities while de-allocating the coal block. The Prajapati Tripathi-headed five-member committee, including some retired senior bureaucrats, will hold separate meetings with all major departments to review their performance ever since the mechanism was introduced around this time last year. The main departments where a one-on-one meeting will be held include Power, Forests, Education, Health, Environment, Public Works, Rural Development and Tourism. The committee on RFD held talks with Secretary level officers from the state in New Delhi on October 30. The new concept of RFD was introduced in December last to monitor the functioning of various government departments. The committee will review the achievements of targets set by individual departments for 2012-13, fund utilisation and the setting up of targets for 2013-14. With the committee expected to grill the major departments on various aspects by seeking action-taken reports, exhaustive preparations are being made in advance. A pat from the RFD team in case of good results and performance can help the state seek more funds from the Centre. The committee is expected to closely monitor the implementation of Centrally sponsored schemes like Mahatma Gandhi National Rural Employment Guarantee Scheme, National Rural Health Mission and road-building and housing schemes. Focus will also be laid on the social and economic uplift of weaker sections of society like Scheduled Castes, Scheduled Tribes and women, who are more vulnerable. Even though Himachal Pradesh has been performing well on practically all fronts, especially health, education, environment, infrastructure development and e-governance, the RFD review holds great significance. Development indicators of the state have been applauded not only among small states, but even among big states. With Himachal Pradesh emerging as a model hill state in the country, many other states have replicated the formulae adopted by the state in its journey to development. The Gopalpur zoo in Kangra district has new guest, a Himalayan tahr rescued by forest officials in Chamba. The Himalayan tahr (hemitragus jemlahicus) or the common tahr is a large ungulate of the wild goat family. The Himalayan tahr is a rare species sighted in the wild and moves in herds in the higher reaches of the Himalayas. Its habitat is the rugged hills and mountain slopes of the Himalayas. It spends the summer grazing in the higher reaches and comes down in winter. The Chief Conservator of Forests, Chamba circle, ARM Reddy, said the animal would be kept at Gopalpur for some time and would be shifted to the Tuti Kandi zoo or left in its original habitat next summer after stabilising in captivity. It would be released in the wild only after obtaining permission from the competent authority, he said. Reddy said they got information from Shiv Kumar of Sachuin village, 1 km from Bharmour, that a wild animal was in his custody. He added that forest officials rushed to the spot, inspected the premises and took into possession the male Himalayan tahr, which was about six months old. Its medical examination showed the animal to be in good health. An investigation revealed that the animal took shelter in Shiv Kumar’s cowshed on November 26 after straying from its habitat. When the animal was being taken to be rehabilitated in the core zone of the Kugti sanctuary on November 28, it strayed back into habitation. It was decided to send the animal to the Dhauladhar Nature Park in Gopalpur, 20 km from Dharamsala, to avoid any poaching or accident. The animal was being kept in a specially designed cage in Gopalpur. Reddy said more rare and endangered wild animals and birds were likely to migrate to the lower reaches in winter. Rescue teams were constituted to prevent poaching and accidental death of wild animals, he added. The government is toying with the idea of declaring fourth Saturday a holiday in government offices located in the state capital, including the Secretariat, so that there can be cost cutting as well as reduction in green house gas emissions. Field offices in the district would not be covered under this decision. The Department of Environment has been entrusted with the task of preparing the economics by linking the cost cutting with the environment cost. The statistics worked out on the basis of cost per employee per day in office would be placed before the Cabinet, which will take the final call on the much-debated issue. In fact, the experiment is being viewed as an attempt to follow the Gujarat pattern that rather than making it a five-day week has adopted the staggering approach by having second and fourth Saturday off. Some of the neighbouring states like Punjab, Haryana and Delhi have already switched over to a five-day week like all Central government offices. The cost cutting would mainly be on power and water used in government offices and fuel used by 3,000 government vehicles. This would then be linked to environment cost in the form of green house gas emissions resulting from use of petrol and diesel by vehicles and use of electricity and water. “We are working out the economic cost and the environment cost per employee per day so that the statistics can be placed before the Cabinet for a final decision,” said Nagin Nanda, Secretary, Environment. Rough estimates worked out by the government indicate that the cost of running 3,000 vehicles everyday works out to be about Rs 25 lakh per day. After banning the use of “angithis” in offices, power bills are also a major burden on the state exchequer every month. However, the proposal would be placed before the Cabinet only after the formation of the new government. It is expected that the opinion of various employees’ associations would also be elicited so that there is unanimity on the matter. According to investigations, tax evasion to the tune of Rs 200 crore has been detected by the DGCEI and investigations were still under way to unearth the modus operandi. According to information, the second unit was accorded approval in 2010 by the Industries Department, while the unit had put forth a claim before the Central Excise Department in June 2009 that it had commenced production and should, therefore, be given Central excise exemption for 10 years. The claim pertains to the period when the unit did not exist. According to norms, a unit, which had commenced production till March 2010, was eligible for such an exemption under the Central Industrial Package granted to Himachal. However, the unit was granted consent to operate on July 29, 2010, by the State Pollution Control Board and it obtained permission to run two DG sets of 1,650 KW on March 25, 2010. This amply proved that the second plant was not operational in June 2009 as had been claimed by it. It was learnt that the first plant was bifurcated into two in 2009 to avail tax benefits and the plant management had failed to respond to the detailed queries of the Central Excise Department, which had detected irregularities in its claim. The unit, where 5 Star, Dairy Milk and Gems were to be produced, was mired in controversy with the Kraft Foods, which took over Cadbury in 2010, detecting payment of kickbacks to obtain speedy clearances with faulty documentation. The emergence of this case has exposed the negative fallout of the Central Industrial Package, which was granted to the state to boost industrialisation in 2003. With cases of evasion of ESI dues by other MNCs also coming to fore in Baddi, a question mark has been put on their operations. The students today boycotted their classes and held demonstration on the makeshift university campus and raised anti-university slogans. They alleged that the buses used for carrying them were outdated and in a dilapidated condition, which resulted in the accident. The students stopped a bus and asked the university authorities to inspect the bus and demanded that the university should have its own buses to bring students to the campus and back to hostels. They alleged that the food prices in the canteen were exorbitantly high and medical facilities were lacking in the university. The students demanded that there should be ambulance facility as the campus was situated at a far place from Tanda and Dharamsala. They also demanded Internet facility in the boys’ hostel, besides fee refund to students of bioinformatics in case the laboratory could not be established. Vice-Chancellor of the university Furqan Qamar, along with other university officials, arrived on the scene and talked with the protesting students. He also inspected a bus that was in a poor condition. Prof Qamar said the university authorities had already initiated steps to redress the issues raised by students. He said regarding the bus services, action was being taken to replace this fleet of buses. In the Bioinformatics Department, four teachers were appointed and computers were already in place and the laboratory was also being strengthened. The anti-ragging committee of Dr RP Government Medical College today expressed concern over the directions issued by the Director Medical Education (DME) to revoke the suspension orders of two interns of the college. The orders were issued by the principal of the college on the recommendations of hostel wardens, disciplinary committee and the college council. However, the DME suggested issuing an appropriate reprimand or a warning letter to both the students. Anil Chauhan, principal of the college, said two interns were suspended from their internship-training programme for a month for indiscipline. The suspension was made effective on the recommendations of the hostel wardens, followed by the disciplinary committee and the college council. Meanwhile, the DME on the request of the students’ parents directed the principal to withdraw the suspension orders and suggested to issue an appropriate reprimand or a warning letter to the duo. Meanwhile, Dr Madhu Choudary, Additional Director, DRPGMC, Tanda, said in consultation with the principal, it was decided that as the time period of the suspension was over today, therefore, there was no need to revoke the orders. Addressing mediapersons, Ajit Baghla, president of the forum, said Chief Minister PK Dhumal had laid the foundation stones for 12 new projects in Palampur town in the past three years, but the construction for these projects was yet to be taken up. The Chief Minister had laid the foundation stone of a multi-storey parking project in the town on June 8, 2008, but till date no efforts were made to take up the construction of the project. There are a number of other projects where only foundation stones are seen without any signs of construction. Another project of a residential complex for doctors at the local civil hospital has also been hanging fire, the foundation stone for which was laid by the Chief Minister in 2010. All 11 occupants of Tata Sumo, including its driver Billu Ram of Baruee, were injured. Out of the injured, two persons have been admitted to the local Civil Hospital. Their condition was stated to be serious. Rajinder Jaswal, DSP, said the police had registered a case under Sections 279 and 337, IPC, against the driver of Tata Sumo for negligent driving. He said a probe had been ordered in this regard to look into the cause of the accident, which left 38 persons injured. The DChad taken up the matter with the university authorities to take effective steps for safe transportation of students from hostels to the university campus. In a press note issued here, he advised Lal to wait for the results on December 20 instead of levelling charges against others. “I thank Congress chief Sonia Gandhi and general secretary in charge, Birender Chaudhary for putting a stay on expulsions,” he said. He said despite being expelled from the Congress, he had always remained loyal to the party by not contesting against the official nominee or working against him.